Here at The Breathalyzer Shop we fully appreciate that the choice of breathalyzer can be daunting and very confusing which is why we are here to offer advice and guidance through the buying process ! We only stock the very latest models, and do not sell 'old stock' or gimic style units carrying false promises of accuracy levels and strange endorsements. Full easy user guide instructions are included on all breathalyser purchases. You do not require any training to use any of our breathalysers, even the Police grade Drager range. Just turn on, fit the mouthpiece and blow - EASY ! Beware - All Breathalyzers should only be used as a guide - Do Not Drink & Drive !! How Accurate Is A Breathalyzer ? We only sell a select range of quality breathalyzers. We don't sell novelty keyring type 'breathalyzers' as these are little more than toys. As with any purchase, in general terms, the more expensive the model, the higher the specification and accuracy. All our breathalyzers feature advanced semiconductor sensors (the Drager, Alcovisor and Alcotector models feature superb fuel cell sensors, as used by UK and worldwide Police forces) and the highest spec models provide high accuracy levels. However, to ensure accuracy, it is important that a deep lung sample of breath is blown into any breathalyzer. In addition, do not test until approx 15-20 mins after your last alcoholic drink as residual alcohol in the mouth will give a false reading. Toothpaste and mouthwash will also affect the reading in a similar fashion. All our breathalyzers are supplied with comprehensive easy to use instructions and general guidelines. This is a small, compact breathalyzer which now has the added benefit of mouthpieces for enhanced accuracy. It is slightly smaller than an average mobile phone and slips easily into a pocket or handbag. Perfect for leisure/party and fun use. The unit is designed to indicate the presence of alcohol on a breath sample and is not therfore highly accurate. It will however give you a 3 digit lcd readout of your breath alcohol content. An ideal affordable gift for birthdays/xmas etc. The AL2500 Elite X 2011 (Black) model also features flow check and error sensor technology with an auto shutdown feature. Great gift and fun at parties etc. Brand New Breathalyser. This is a breathalyzer offering great accuracy at a competitive price. It is supplied with 5 mouthpieces and its own smart, compact soft pouch carry case. 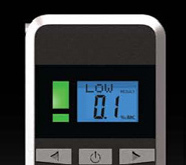 The AlcoSafe KX6000S displays alcohol readings to 3 digit accuracy. Ideally used by individuals requiring reliable, accurate readings. It has the added advantage of also displaying a patented RED/AMBER/GREEN traffic light system which gives you a clear indication of your breath alcohol content. It carries an FDA (Food & Drug Administration) and European Certificate. This is a serious breathalyzer in use with some law enforcement agencies worldwide as an initial screening device and also in use with the US coastguard. It has the ability for the user to simply click in and click out a replacement sensor when required, avoiding expensive downtime and the requirement to recalibrate. Supplied with 5 reusable mouthpieces (although we do recommend extra mouthpieces for professional use), its own carry bag, this is an attractive, compact and very capable unit. Ideally suited to high end users such as NHS, GP surgeries, Universities, Colleges, Employers and individuals who can not afford to compromise on accuracy - airline pilots, professional drivers, train drivers etc. It carries an FDA (Food & Drug Administration) and European Certificate. This again is a serious breathalyzer when accuracy and reliability are important. The AL7000 Premium is a new product, fresh to the market, and features the very best in advanced semi - conductor technology coupled to a very easy click IN/OUT sensor replacement changing system - it takes seconds to replace the sensor (recommended after approx 250-300 tests). The brushed metal case is well made. This is, quite simply, a highly sophisticated, attractive unit which looks and feels very sleek and modern. Supplied with 5 reusable mouthpieces (although we do recommend extra mouthpieces for professional use), its own carry bag and a handy in car 12v connector cable. This is aimed at the high end user market such as NHS, GP surgeries, Universities, Colleges, Employers and individuals who can not afford to compromise on accuracy - airline pilots, professional drivers, train drivers etc. It carries an FDA (Food & Drug Administration) and European Certificate. If you are considering bulk testing then you should consider the Alcovisor Mk X below. Latest Version The Alcovisor Mk X offers outstanding accuracy at an affordable price. This is a fuel cell (electrochemical sensor) employing similar technology to Police units and offering similar accuracy to Police grade screening units. Now with full colour TFT LCD screen ! This is particularly well suited to employers or individuals who need the extreme accuracy of a fuel cell device but at a much cheaper price than a UK Home Office approved Police unit. Don't be fooled by the modest price tag for a fuel cell device - this offers superb accuracy for a fraction of the cost. Latest Version The BAC100 is the only breathalyser in The World that combines Police grade accuracy with a built in thermal printer. It offers Police grade accuracy at a fantastic price and is in use with the Police Forces of USA, China, Argentina, Thailand, China, India to name a few. This is a great breathalyser for employers wishing to screen/test their workforce, needing a hard print out but without the additional expense of a full UK Home Office unit such as a Drager 6510/6810. The combined printer offers substantial cost savings over a Drager breathalyser/printer combo. The Drager 6510/6810 both carry full Home Office Approval for use as roadside breathalyzers by UK Police forces. They are in use with a substantial number of UK Police forces. If you get stopped at the roadside by a Police officer, the chances are high that a Drager 6510/6810 breathalyser is employed. These are 'fuel cell' units which are expensive to manufacture but have unrivalled reliability and accuracy levels. It doesn't come any better than Drager for quality and reliability. They are an ideal unit for professional organisations/employers who require a highly accurate and reliable reading for perhaps follow up disciplinary action/suspension. These units have been used as the basis for disciplinary action against employees in numerous cases where a lower grade semi conductor device would have carried little weight at an employment tribunal. In a nutshell, they are accurate enough for UK law enforcement. If you are likely to need written proof of a breath sample for future action then we recommend the Drager 6810 series which has a wireless, portable printer. The 6510 has the same accuracy levels but does not have the facility to download the result to a printer. If you need any advice or further information on any of our units then please consult the individual product pages - feel free to call us for friendly, no obligation advice - We are here to help you make an informed choice, not just sell you any breathalyzer we can ! If you call us and our staff are all busy taking other calls, please leave a message, we promise we will get back to you, within the hour normally. If you have any problems with your unit after buying from us (extremely rare), we will sort it out and not fob you off with excuses.